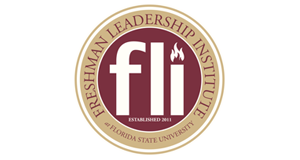 The Freshman Leadership Institute (FLI) is an executive project within the Student Government Association at Florida State University. FLI shall provide members with the opportunity to embrace their personal values, explore and develop their personal leadership style, and foster a deeper sense of self-identity. The program encompasses weekly workshops, a weekend retreat, family groups, and a peer mentor program for student participants. During the workshops students are exposed to campus resources, opportunities, leadership development activities, and much more. This unique opportunity allows freshman to make connections and build relationships with other FSU students interested in leadership development. Not only do students have the opportunity to network, but they also gain valuable knowledge and skills to leave a legacy at our University. Each summer we recruit and select about 40 freshman who will participate in the ten week program. Workshops: Workshops are the core of FLI. Participants will attend a mandatory two hour session once a week for 9 weeks. This aspect of FLI is the base for the program and provides the tools for participants to educate themselves on becoming involved student leaders in the FSU community as well as to better their personal leadership capabilities. Family Groups: Each student will be placed in a Family Group with one facilitator in order to create a deeper connection with a smaller group of participants. During the workshops, Family Groups will debrief the topics discussed. These groups will meet outside of the weekly workshops to build relationships. Committee Clusters: Each student will be placed in a Committee Cluster with two co-facilitators responsible for ensuring student participation and delegation of the duties outlined within each group. FLI shall provide members with the opportunities to foster strong relationships with fellow student leaders within a group setting in order to achieve a common goal. Details of the Committee Clusters can be found here. Peer Mentoring: Each participant will be paired with a Peer Mentor who will provide guidance and assistance as the student adjusts to campus life and prepares to expand their involvement at Florida State. Details of the Peer Mentors can be found here. Mission: The Freshman Leadership Institute’s mission aims to provide first year students with the tools to become active student leaders while providing support as students adjust to the Florida State University campus and culture. With an emphasis on individual, group, and community values, students will develop a leadership identity with the support of their peers and Student Government Association staff.